Every so often I am lucky enough to get a good batch of time with Louise Curham, to push forward our ongoing investigations as Teaching and Learning Cinema. 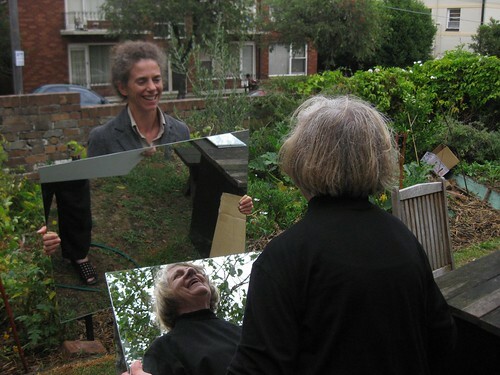 In the first half of 2009, we developed a re-enactment we’d been thinking about for (literally) years: Guy Sherwin’s expanded cinema piece, Man with Mirror (originally performed in 1976 in London). You can read more about Sherwin’s work, and our re-enactment of it, over here. We are interested in re-enactments as they allow us to directly ephemeral work from the past which is otherwise only available in documents, texts, videos and photographs. Of course, the re-enactment changes the original work. What decisions do we need to make in order to manifest it in our present time and place? These are part of the creative process, and this is why we believe that artists make great “experiential archivists”! The work was developed as part of the exhibition IMPRINT, curated by Anneke Jaspers, at Artspace, Sydney, in July 2009. After the exhibition at Artspace, Anneke published a catalogue with an essay and images showing the development of each artists’ work. You can download a copy of the catalogue here [12mb PDF file]. In 2007, Louise and I re-created the conditions for a contemporary experience of Anthony McCall’s work of expanded cinema (or “paracinema“), Long Film for Ambient Light (1975) at Performance Space, Sydney. An essay I wrote about our re-creation (entitled â€œAttending to Anthony McCall’s Long Film for Ambient Lightâ€) will be included in the forthcoming book Perform, Repeat, Record: A Critical Anthology of Live Art in History, edited by Amelia Jones and Adrian Heathfield. A re-doing, with Nick Keys and Astrid L’Orange, of Allan Kaprow’s Push and Pull: A Furniture Comedy for Hans Hoffman at Locksmith Project Space in 2009. Read about it here.